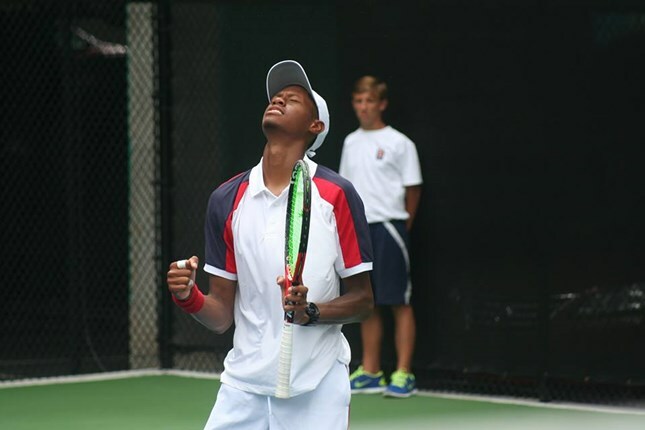 Georgia Tech’s Christopher Eubanks defeated former Samford player Zac Dunkle 7-6(5), 6-3, 6-1 to clench the 2016 BB&T Atlanta Open Wildcard Challenge championship, held on July 27 on the practice courts at Atlantic Station in Atlanta, GA. Eubanks will be a junior on the Yellow Jackets squad for the coming school year. In the first set, both players made it clear this would be a battle of big serves, both with multiple aces in their first two service games. The returns caught up with the big serves late in the opener as they traded breaks to force a tiebreaker. Dunkle earned a set point with an ace late in the tiebreaker to take it 7-5. Although down a set, Eubanks found his form and more consistency off the ground to secure the second set 6-3. In the third set, the Georgia Tech standout jumped out to an early 5-0 lead over Dunkle with behind two quick service breaks. Being a current college player, Eubank's endurance and his aggressive play proved to be the deciding factor throughout the final set. Eubanks said he had to stick to his game plan, even though he lost the first set. "I knew he had been playing well all summer. I kind of expected him to come out playing well and he did. My goal was to stick with him and weather the storm." He did weather the storm, and the BB&T Atlanta Open's Eddie Gonzalez said Eubanks may have been a little more "match tough." Eubanks knows the hard work now begins as he looks to make a long run in the ATP World Tour 250 event that kicks off Saturday. "I'm hoping for a busy 10 days here," admitted Eubanks following his win. "A little rest, but I'll hit the practice courts even later today. It was a tough day and I'm happy to get through it." The BB&T Wildcard Challenge keeps growing each year. In winning the BB&T Wildcard Challenge, Eubanks earns a spot in the qualifying draw for the BB&T Atlanta Open. The qualifying rounds begin play on July 30. The rising Georgia Tech junior will also play doubles with Zack Kennedy of Georgia State in the BB&T doubles draw.